The odd, opportunistic and eccentric programming of Netflix streaming, the way the service lumps genres together and serves up possibilities, means that you’re always stumbling across something odd and old, or new and surprising — a movie you haven’t seen that you should have. That’s a pretty neat trick for somebody who’s seen 500+ movies a year going back decades, like me. I stumbled into “The Robber,” a German-Austrian thriller “inspired by a true story,” a prime piece of Euro-action worth remaking by Hollywood. Andreas Lust stars as Johann, an Austrian loner whom we meet just as he’s finishing a stint in prison. He’s spent his time in stir doing lap after lap of the prison yard, perpetually training. He’s planning to pick up where he left off — running marathons — when he gets out. The authorities fret that he’s only focused on that, that marathoning isn’t a career, that a combination of financial need and an addiction to adrenalin rushes will see him tumble back into the practice that put him in prison in the first place — robbing banks.Johann isn’t hearing it. He’s not making any promises. And sure enough, the minute he’s out, he starts vigorously prepping for marathons, obsessively monitoring his heart rate. Sure enough, he returns to the avocation that got him caught the last time — donning a mask and a hoodie, picking up a shotgun and hitting the hapless banks in this corner of Austria. 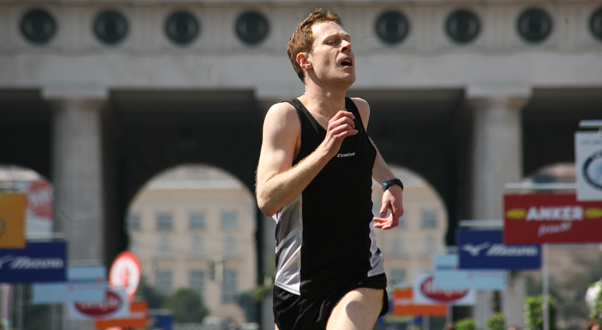 What co-writer/director Benjamin Heisenberg’s film does best is emphasize “The Loneliness of the Long Distance Runner,” to reference an earlier film about the mindset involved here. Johann’s solitary lifestyle has him alone with his thoughts and his demons. When you don’t talk to anybody, keep to yourself, steal cars to get to the banks, then ditch the cars and sprint miles and miles to get home, nobody can connect the dots. Or so it would seem. You’d think that a masked robber who is in unusually good shape would point right back to a guy who just got out of stir. But the Austrians in the movie don’t make the connection. he will have a place to stash his cash, all feeding his marathon habit. Even when he starts entering and winning marathons, bursting on the scene from out of nowhere, that’s not enough. It’s not winning that he’s in it for. Heisenberger stages “”Point Break” styled getaways — long, desperate sprints through narrow streets, parking garages , through parks and alleys, emphasizing how easy it might be for someone with speed and epic stamina to outmatch and outwit legions of cops. In the right urban environment, Johann has advantages that the robbers of “The Town” could only dream of. The film wastes no time on casing the banks, Johann’s apparent prep work. It limits itself to his (and Erka’s) point of view. So we have no idea why the cops haven’t pieced together this “We just let a marathon runner/bank robber out of prison, and this new robber seems to run like the wind” puzzle. “The Robber” is bleak and yet exciting, a fascinating character study built around a pretty unpleasant “hero.” If Hollywood could find a star willing to get in spectacular cardio-vascular shape, a lean-mean running machine, I could certainly see a remake of this hitting it big. “The Robber,” made in 2010, is currently available on Netflix streaming, right after the superb French thriller “Point Blank,” in your “foreign language thrillers” queue.